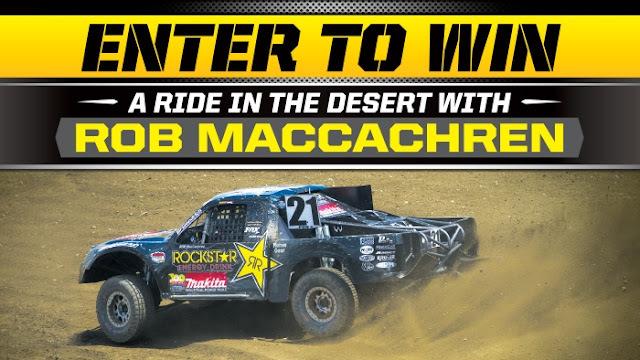 Rockstar Energy Drinks wants you to enter once for a chance to win a trip to the desert to hang out with and RIDE with their off road racing driver Rob MacCachren in VEGAS and more! PRIZES. The Grand Prize Winner will receive a ride with Rob MacCachren. Trip includes: • Round-trip airfare for two from major airport nearest winner’s residence to Las Vegas, Nevada; • two nights Sponsor-specified hotel accommodations for two (2) people, single room/double occupancy, check-in and check-out dates and times to be determined by hotel and/or Sponsor, at their sole discretion; • Ground transportation to/from airport; • One (1) Rockstar gear pack; • One (1) year supply of Rockstar (12 cases) Total ARV of all Prizes to be awarded in this Promotion: $1,950 USD. This Sweepstakes ends on 10/23/16 and you can ENTER ONCE to win.